Thousands of Arkansans maintain feeders and plant flowers to attract hummingbirds. The beautiful Ruby-throated Hummingbirds with their jewel-like colors and legendary aeronautical skills are the hummingbirds most likely to be seen. Ruby-throats are the only common hummingbirds in the eastern U.S. THANK YOU FOR PARTICIPATING IN THE HUMMINGBIRD COUNT. 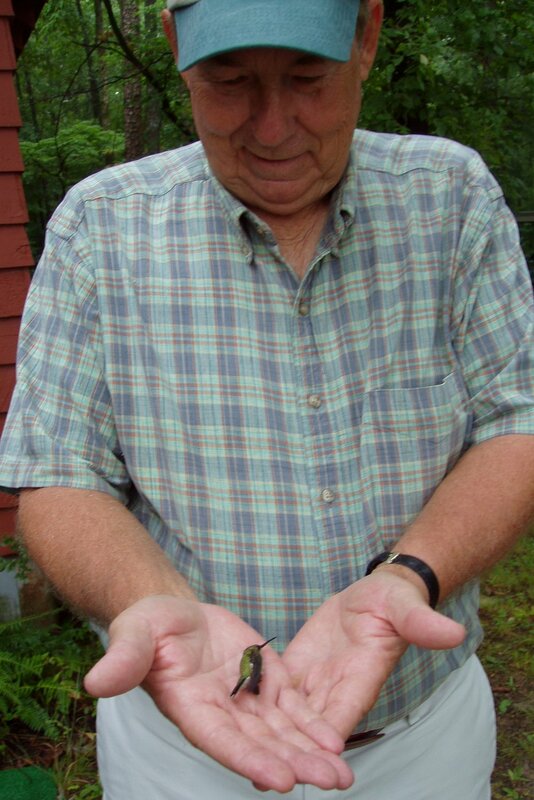 The Ruby-throated Hummingbird weighs as much as a penny. Hummingbirds are the only birds that can fly upside-down and in reverse. In flight a hummingbird’s heart may race to 20 beats per second. Male Ruby-throated Hummingbirds beat their wings at a rate of 70 strokes per second; females make 50 strokes per second. To equal a hummingbird’s metabolism, a human would need to digest an d process twice his or her weight in food every day. Hummingbirds lap nectar with their tongues, at a rate of about 13 licks per second. Nectar is not sucked, in the manner of drinking with a soda straw, but wicked up a shallow, W-shaped groove in the tongue. Hummingbirds conserve energy at night by entering torpor, a short-term form of hibernation. About 150 U.S. plants are pollinated by hummingbirds rather than insects. Hummingbird eggs are so small you could theoretically mail five dozen with a first-class postage stamp. First-year hummingbirds migrate alone rather than with parents or experienced birds. They are born with an innate sense of where and when to fly. Nineteen species of hummingbirds live in the continental United States. If you though there was only one in Arkansas—the Ruby-throated Hummingbird—you’re wrong. Nine species have been documented in the Natural State. Until 1984, though, the ruby-throat was the only species know in Arkansas. It remains the only nesting species, but eight others occur here as rare transients or winter residents. These birds usually appear in autumn and may stay until late winter, but some unusual species, such as the Green Violet-ear, have been seen only during spring and summer. We need to learn more about hummingbirds in Arkansas, and you can help. First, keep at least one hummingbird feeder hanging throughout the year. Some people believe it’s necessary to remove the feeders by October 1 so the ruby-throats will migrate, but that’s not true. Ruby-throats migrate when the time comes, no matter what we do with our feeders. You don’t endanger the birds by providing nectar. In fact, by removing their food source, you could be making their trip south more difficult. Also, as hummingbirds from other parts of the country arrive, they need a food source. Keep at least one hummingbird feeder full of fresh nectar year-round. Bring your feeder(s) indoors during sub-freezing weather unless a hummingbird is present. During cool weather (below 65°) replace the nectar every two weeks. During warmer times, replace it weekly. Don’t use commercial mixes or add food coloring to your nectar. A simple recipe, proven to work, is four parts water to one part sugar placed in a colorful feeder. Lilly Wallick releases a hummingbird. Ruby-throats are common migrants and summer resident throughout Arkansas. Spring migrants usually appear in late March or early April. Nesting activity has been observed from late April to mid-August. The peak period for fall migration, when the birds fly to wintering grounds in Mexico and Central America, is in September, but there are scattered reports of ruby-throats in the state as late as December. Hummingbirds feed numerous times each day from nectar-bearing flowers and nectar feeders. Hummingbirds need to eat an average of 7 times per hour for 30-60 seconds each feeding. Most hummers won’t pass up an easy nectar meal from feeders and most hummingbird fans won’t pass up the chance to watch them dart about. Feeders with glass jars and few moving parts are easier to clean and maintain. Cleaning feeders and changing nectar should occur every three days to prevent mold build up during warm weather and in weather below 65 degrees replace nectar every two weeks. Do not use bleach, insect sprays or petroleum-based products on nectar feeders. Hanging multiple hummingbird feeders (3 or more) about 10 feet apart, will attract more hummingbirds. Hummingbirds see further and hear better than humans, they have no sense of smell. They will find your feeders. If you have bee or wasp problems at your nectar feeder, try creating a diversion for the bees and wasps. Take down all your hummingbird feeders and create only one with strong sugar syrup: ½ cup sugar per 1 cup of water. Put this heavy syrup feeder in an out-of-the-way spot-- away from where you want your hummingbirds to feed. Bees and wasps will find the heavy syrup and stay with that one. You can return your hummingbird feeders with the regular sugar water (1 cup sugar to 4 cups water) to your favorite location a few days later.